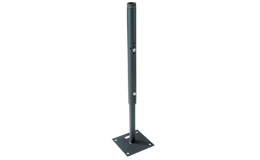 This extension is an easy to install option designed to provide quick height adjustment for your installation needs. This extension can be secured to ceilings or joists and to the ceiling mount of any of the projectors listed below. This ceiling mount extension allows you to quickly and easily achieve the correct drop distance (24 1/4" to 46") and is adjustable in 3/4" increments.